If you’re binge watching House of Cards or Grace and Frankie like I am, you’ll probably like to know how to avoid mindlessly munching hundreds of calories when you’re sucked into watching episode after episode. Binge-watching is a THING, thanks to the amazing number of series and shows that are on premium networks and streaming services. And when the next episode starts just 10 seconds after the previous one ended, it takes willpower to stop watching, when your mind is telling you, “just one more episode.” In fact, according to a recent survey by Dole Packaged Foods, the average binge-watching session clocks in around 5 hours. Watching TV and snacking often go hand-in-hand, which can become a diet disaster. Typical evening snacks, like salty chips, ice cream, crackers and cheese can add 500 calories or more during hours-long viewing sessions. And, because your mind is distracted by whatever Frank Underwood or Frankie are doing, your brain doesn’t provide the normal cues to your stomach to that tell you that you’re full. Opt for snacks that are low in unhealthy saturated fat, added sugars and empty calories like salty chips, candy, baked goods or frozen desserts. 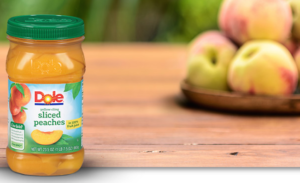 Keep your kitchen stocked with better-for-you options that are easily accessible, like a fruit bowl on the counter, cut veggies in the fridge along with ready-to-eat Dole Jarred Fruit. That way, when you’re looking for a nosh, you can whip up something good for you between episodes or during a commercial break. Dole Jarred Fruit provides fruit on demand and comes in resealable jars that contain five full servings! The best snacks provide fiber, to help you feel fuller on fewer calories. Great options are fruits, veggies and whole grains. Some of my favorite TV snacks include air-popped popcorn, chia and fruit pudding, and fruit and yogurt parfaits and fresh-cut veggies with hummus. When you’re craving chocolate, start with fruit and dip in melted chocolate and pop in the freezer. It will be ready by the end of the next episode. Keep extra snacks in the kitchen and out of sight, so that you have to make an effort to get seconds. When food is out of sight, it’s more likely to be out of mouth. Layer fruit and yogurt in a small glass or jar. Top with shredded coconut. Toast whole wheat waffle. Combine yogurt with cinnamon. 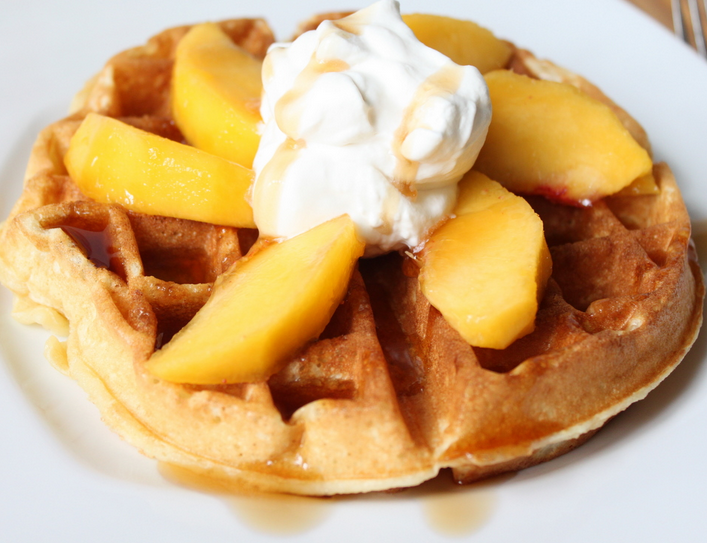 Top waffle with sliced peaches and yogurt. This season of Grace and Frankie is soooo good! Much needed snacks to keep the binge going!